The RealtyTrac site captures a lot of data on foreclosures. When you hear about the national trends for the foreclosure rate from the media that may be very different than the picture in your own area. 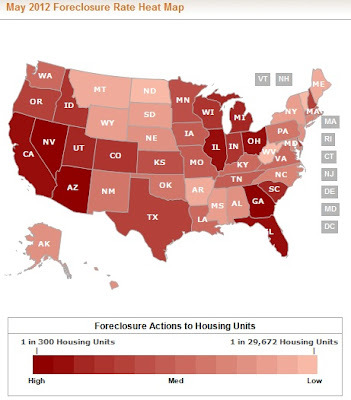 Some states and cities have been hit far rose by foreclosures than others. Real estate is a very local market so its best to check the trends in your own city. If you want an idea of how things are in your own city then you can find that at RealtyTrac too. I tried to use their embedded widget for this article but it didn't fit right so I resorted to a static picture. The national map shown above is at the RealtyTrac trend site. If you click on your state then it will take you to data for your state. From your state level you can then drill down into the county level numbers. So for example you can see the the trends for Nevada then Clark county then Las Vegas where you can finally see the numbers broken down by individual ZIP codes.